Counting of votes at a polling unit. 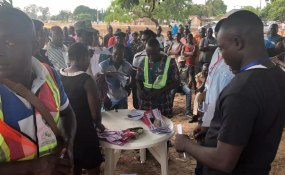 Election observers in Akwa Ibom on Monday narrated their experiences in the just concluded general elections in the state. At a post-election event in Uyo, one local observer said vote-buying was a phenomenon in the elections. "The two major political parties, PDP and APC, struggled to outdo each other in the amount of money they were giving out to voters during the election," the observer said while narrating his experience in the election. He said one party, through its agent at the polling unit, was dishing out money in naira to voters, while the other party was paying in dollars. More than 30 observers attended the event. Most of them were of the opinion that the elections, though fraught with irregularities, was 'generally' free, fair, and credible. Apart from one local government area where the All Progressives Congress (APC) won the House of Assembly election, the Peoples Democratic Party (PDP) won in all the elections in the state. The event, tagged "Stakeholders' Briefing on Niger Delta Watch 2019", was organised by Stakeholder Democracy Network (SDN), in collaboration with the Nigeria Civil Society Situation Room. Joseph Ekong, the SDN team lead, said they monitored the elections in the 31 local government areas of Akwa Ibom State, tracking incidents that occurred with the intention of getting the information across to stakeholders like the Independent National Electoral Commission (INEC), the police and other security agencies, as well as the media. Mr Ekong said he was hopeful that the information gathered from the field and passed on to the stakeholders would be used for the purpose of improving future elections in the country. Policy Alert, an NGO in Akwa Ibom, coordinated the monitoring of the elections in the state. Tijah Bolton-Akpan, the executive director of Policy Alert, in his presentation at the briefing, said elections in the state was characterised by violence, ballot-stealing, vote-buying, harassment of election observers and journalists, and the late arrival of voting materials. "Our observer in Oruk Anam Local Government Area had to hide in the bush for several hours till around 9 p.m.
"In Ibiono Ibom, the PO (presiding officer) in one polling unit had to run through the bush to get to the collation centre. We had reports of thugs being arrested in hotels in Uyo, a day to elections," Mr Bolton-Akpan said. Mr Bolton-Akpan spoke about the razing of the local office of INEC, the burning down of buses conveying election materials in the state, and the cancellation of elections in some wards in Essien Udim and Udung Uko local government areas due to violence and other malpractices. "For fear of violence, there was a low turnout of voters in the governorship election in the state, compared to the presidential election," he said. Mr Bolton-Akpan said INEC wasted much time in deploying election officials and materials for the elections. He said members of the National Youth Service Corps (NYSC) who participated in the elections were kept in deplorable conditions which affected their performance in the elections. "The ad-hoc officials were not well-trained. There's a need for voters to understand that what you give is what you get. It's time the electorate take the electoral process seriously. "On the whole, the election in Akwa Ibom State in 2019 was an improvement on that of the 2015 elections. But there is much that still needs to be done," he said. However, a university lecturer, Aniekan Brown, who attended the briefing, said INEC deserves some commendations for the 2019 elections in Akwa Ibom. Mr Brown, a lecturer in the department of sociology and anthropology, University of Uyo, said the just concluded elections was "the nearest to the best" in the state. "INEC has done its best to educate voters in the state, it is left for political parties to take up the responsibility of voter-education," he said. "Even the politicians themselves are not politically educated," Mr Brown added.